It's a Jimmy John's. To me, that means that it falls into the category of "slightly nicer than Subway" sandwich joints. I like Subway well enough (even if Bowie has more than it needs), and I like "upscale" sandwich restaurants (Jimmy John's, Firehouse, Potbelly, etc.) slightly better. It's not too exciting, but a sub's a good meal. 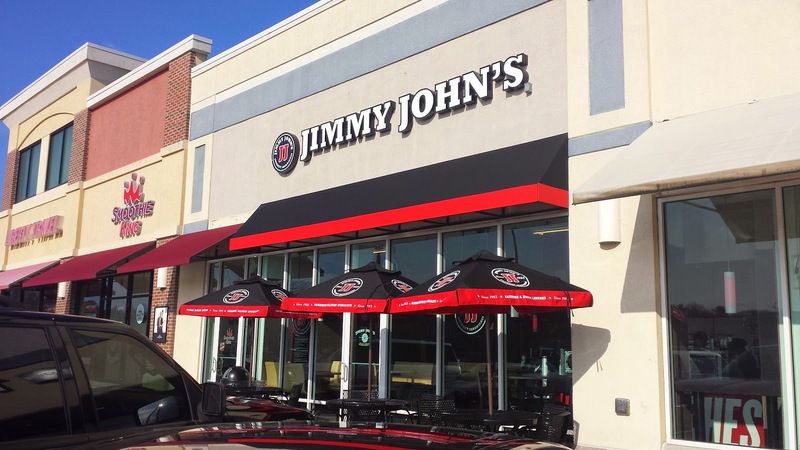 The Jimmy John's in Bowie Town Center opened about a week ago, and they seem to be doing a fine job. The on-line ordering works well. I think telling someone your sandwich order is tiresome, so on-line is the way to go. I appreciated that I was able to do it from the web without downloading an app I would never use again. I was somewhat irritated that they wanted 30 minutes to have my order ready, but in fact it was ready in less than 15. Apparently I used their on-line ordering in 2011 at the Jimmy John's in College Park, and I was irritated when they only gave me one bag of chips. This time, they showed me where to get the chips myself, so it wasn't a problem. Jimmy John's "replaces" the Quizno's around the corner that just closed, along with the Subway in the food court. All in all, an upgrade in your Bowie Town Center sandwich choices, but one I have a hard time getting excited about. Well, last time, I had two reviews left to go, and I reviewed one, which leaves me...three? Yep. In the past week, Jimmy John's and First Watch have opened around the corner from each other in Bowie Town Center. I can still see the finish line, though! Grace's Fortune, long my go-to place for taking interview candidates at work, is closing in February. Golden Pavilion has been my go-to Chinese place, mainly because I couldn't justify Grace's higher dinner prices, but I'm looking for a new Chinese place to recommend. I think interview candidates may end up at some place outside Bowie; Thai at Waugh Chapel and Namaste are probably good choices.